Nine categories of art showcase some of the finest artists of our region. Works include Photography, 3-Dimensional, and Fibre Art, as well as paintings and mixed media. All vie for top honours with awards chosen by the voting public on Saturday. A new category has been added this year. The “Budding Artist” features art by youngsters as young as 3 years old to encourage community involvement in the arts no matter what age or ability. While many pieces are for sale as usual, this year many are also for display only, allowing visitors a rare chance to view an outstanding, broader collection of art. Besides viewing the artwork entries, visitors can enjoy two additional displays. The Fabricators’ “Seasons of the Okanagan Calendar” project will be featured on the stage. Each of the members uses several different techniques to produce the quilts featured in the calendar. The Ripoff Artists will also be featured, setting up their creations of this year’s summer challenge, “Queen of the Fish,” by Mimi Parent. Each Ripoff artist re-creates Parent’s needlework mermaid in their own medium, and the results are fascinating! All visitors paying admission by donation on both days are eligible to win a stocked wine fridge. The fundraiser—replacing the Silent Auction of past years—will reward the lucky winner with 17 fine wines from some of Oliver’s best wineries. Show times Saturday are from 3 to 9 p.m. The Opening Reception from 7 to 9 p.m. features live music performed by “Jazz Out West” with radio host Brock Jackson as the evening’s M.C. Saturday’s event concludes with the Awards Ceremony. 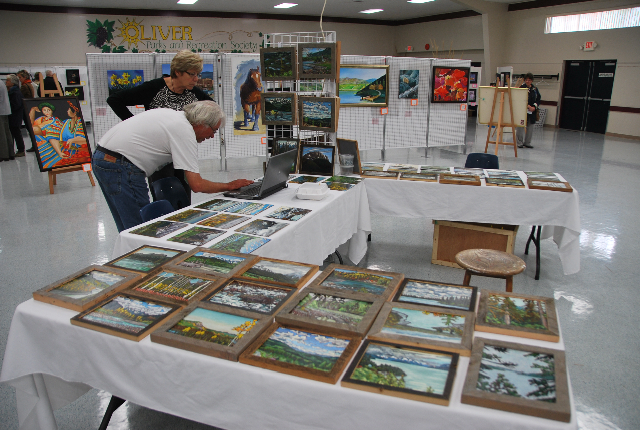 If saying goodbye to summer has dampened the spirit, be uplifted by welcoming the magic and incredible creativity of our local artisans at the “Dreams and Visions” weekend show. See you there! Bring your friends!